Purpose: People chronically infected with hepatitis C virus (HCV) have diminished patient-reported outcomes (PROs). This study aimed to compare the impact of elbasvir/grazoprevir (EBR/GZR) treatment versus sofosbuvir with pegylated interferon and ribavirin (SOF/PR) on changes in PROs: 1) during the treatment period and 2) at posttreatment follow-up. Patients and methods: PRO data collected during the Phase III C-EDGE Head-2-Head (H2H) open-label study was analyzed. In this trial, patients infected with HCV were randomized 1:1 to receive either EBR/GZR or SOF/PR for 12 weeks. Patients self-administered the Short Form-36 version 2 (SF-36v2®) Health Survey Acute (1-week recall) Form and the Functional Assessment of Chronic Illness Therapy-Fatigue (FACIT-Fatigue) Scale at baseline, during treatment, and posttreatment. Between-group differences in mean change of PRO scores from baseline were estimated during the treatment period and also at the posttreatment follow-up. Effect sizes were calculated to evaluate if the detected change in mean PRO scores is clinically meaningful between groups. Results: There were 255 patients (99.2% White, 54.1% female, 74.9% treatment naïve) included in the analysis. During the treatment period, significant declines in SF-36v2 scores were observed across all domains for the SOF/PR group. Compared to the SOF/PR group, the EBR/GZR group reported more improvement in scores across all SF-36v2 domain scores at the end of the treatment period. At treatment week 12, the between-group differences for 6 out of the 8 domain scores for these patients reflected at least moderate effects (effect sizes >0.5). No significant between-group differences in change in SF-36v2 scores from baseline were detected posttreatment. The decline in SF-36v2 scores observed during the treatment period for the SOF/PR group returned to near baseline scores or above posttreatment. 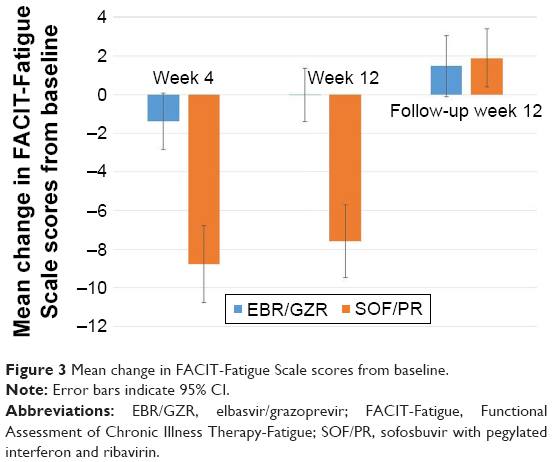 Treatment with EBR/GZR did not impact fatigue scores, but treatment with SOF/PR led to increased fatigue scores during treatment which resolved by posttreatment follow-up week 12. Conclusion: This study demonstrated that HCV treatment with EBR/GZR resulted in a significantly better PRO profile as compared to SOF/PR. PROs are an important consideration as worsening PROs experienced during treatment may negatively influence adherence and ultimately contribute to an unfavorable clinical outcome. In the C-EDGE Head-2-Head (H2H) open-label multinational trial, 255 patients were randomized to receive either elbasvir/grazoprevir (EBR/GZR) or sofosbuvir with pegylated interferon and ribavirin (SOF/PR) for the treatment of HCV.19 EBR/GZR was observed to have superior efficacy and safety in patients with HCV genotype 1 or 4 compared with SOF/PR. The aim of this study is to compare the impact of EBR/GZR vs SOF/PR on changes in PROs both during treatment and posttreatment and to assess whether any observed differences in PROs between the two treatment groups are clinically meaningful. This study analyzed the PRO data collected as part of the Phase III C-EDGE H2H study trial conducted in Europe and Turkey. In the trial, patients with HCV genotype 1, 4, and 6 who were either treatment-naïve or had prior treatment failures with pegylated interferon (PR) were randomized 1:1 to receive either EBR (50 mg)/GZR (100 mg) once daily for 12 weeks or SOF 400 mg once daily, pegylated interferon 1.5 μg/kg once weekly, and weight-based ribavirin for 12 weeks. Details of the study design and results of the C-EDGE H2H trial have been previously reported (ClinicalTrials.gov Identifier: NCT02358044).19 The protocol was approved by the independent ethics committee at each participating site, and all patients provided written informed consent. A list of investigators and independent ethics committee is included in Table S1 of the online supplementary material. PROs were collected as exploratory endpoints of the trial. 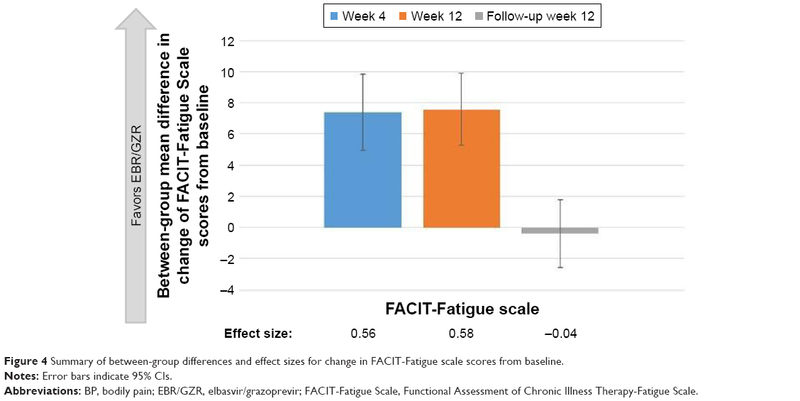 This study analyzed the PRO data collected using the acute Short Form-36 version 2 (SF-36v2) and the Functional Assessment of Chronic Illness Therapy-Fatigue (FACIT-Fatigue) Scale at the baseline visit, during treatment at week 4 (TW4) and 12 (TW12), and posttreatment follow-up week 12 (FW12). Both PRO instruments were self-administered by patients using an electronic data capture tool. Patients who had at least one dose of study medication and had completed at least one baseline or post-baseline PRO assessment were included in the base analytical cohort. To evaluate the treatment effect on PRO scores, mean change from baseline in PRO scores was calculated at each assessment time point during treatment (TW4 and TW12) and posttreatment (FW12), with corresponding 95% CI. To examine the difference between treatment groups, between-group differences in mean change from baseline in PRO scores were similarly estimated at each PRO assessment time point during treatment (TW4 and TW12) and posttreatment (FW12), with corresponding 95% CI. Missing data were not imputed, and the estimation of mean scores was based on all available data at each time point. A total of 255 out of the 257 randomized patients were included in the analysis. Two patients in the SOF/PR group did not receive any study medication and were excluded from the analytical cohort. There were 129 patients in the EBR/GZR group and 126 patients in the SOF/PR group. Baseline clinical and demographic characteristics are presented in Table 1. The mean age of the patients was 48 years across both study groups. The majority of patients were White (99.2%), female (54.1%), and non-cirrhotic (83.1%). Over three quarters (77.6%) of patients had genotype IL28B non-CC, 82.0% had HCV genotype (GT)1b infection, and 74.9% were treatment naïve. These characteristics were comparable across both treatment groups. No GT6-infected patients were enrolled in this study. Baseline PRO scores are reported in Table 2 and were similar between treatment groups. Across all PRO assessment time points, none of the patients were missing all SF-36v2 or FACIT-Fatigue assessments. The overall completion rates for the SF-36v2 and FACIT-Fatigue were high, with >92% and >90% of the patients completing the SF-36v2 and FACIT-Fatigue, respectively, at all assessment time points. Abbreviations: BMI, body mass index; EBR/GZR, elbasvir/grazoprevir; HCV, hepatitis C virus; PR, pegylated interferon and ribavirin; RNA, ribonucleic acid; SOF/PR, sofosbuvir with pegylated interferon and ribavirin. Abbreviations: EBR/GZR, elbasvir/grazoprevir; FACIT-Fatigue, Functional Assessment of Chronic Illness Therapy-Fatigue; MCS, mental component summary; PCS, physical component summary; PRO, patient-reported outcome; SF-36v2, Short Form-36 version 2; SOF/PR, sofosbuvir with pegylated interferon and ribavirin. A decrease in SF-36v2 scores was observed from baseline to week 4 of treatment in both treatment groups (Figure 1), with the SOF/PR treatment group showing a greater decrement in scores. Although this trend of reduction in SF-36v2 scores persisted to week 12 of treatment in the SOF/PR treatment group, improvements in the General Health and Mental Health domains, as well as MCS scores, were observed in the EBR/GZR treatment group at week 12 (Figure 1). Compared to the SOF/PR treatment group, at TW12, patients in the EBR/GZR treatment group reported a more positive change in SF-36v2 scores across most domains of the SF-36v2 (Figure 1). Between-group differences in mean change from baseline in PRO scores were at least 4.80 across all domains, with the greatest difference detected for the Role Limitations-Physical (16.55 in TW4; 21.62 in TW12) and Vitality domains (16.81 in TW4; 20.48 in TW12) (Figure 2). The estimated effect sizes for the between-group change in mean scores ranged from 0.25 to 0.58 at TW4 and 0.42 to 0.70 at TW12. 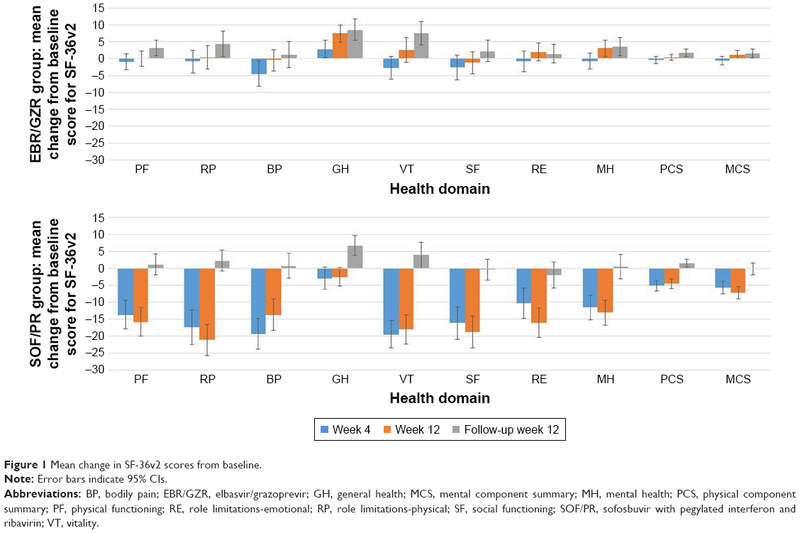 Further, at treatment week 12, except for the Bodily Pain and General Health domains, the effect sizes of the between-group differences of all other domains and summary scores were shown to be at least moderate (>0.50). Figure 1 Mean change in SF-36v2 scores from baseline. Note: Error bars indicate 95% CIs. Abbreviations: BP, bodily pain; EBR/GZR, elbasvir/grazoprevir; GH, general health; MCS, mental component summary; MH, mental health; PCS, physical component summary; PF, physical functioning; RE, role limitations-emotional; RP, role limitations-physical; SF, social functioning; SOF/PR, sofosbuvir with pegylated interferon and ribavirin; VT, vitality. Figure 2 Summary of between-group differences and effect sizes for change in SF-36v2 scores from baseline. Notes: Error bars indicate 95% CIs. Abbreviations: BP, bodily pain; EBR/GZR, elbasvir/grazoprevir; GH, general health; MCS, mental component summary; MH, mental health; PCS, physical component summary; PF, physical functioning; RE, role limitations-emotional; RP, role limitations-physical; SF, social functioning; VT, vitality. After completion of treatment at FW12, mean improvements from baseline scores in five of the eight health domains and both summary scores were observed with the EBR/GZR treatment group (Figure 1). The declines in SF-36v2 scores observed during the treatment period for the SOF/PR group returned to near baseline scores or above. Although the EBR/GZR group demonstrated more improvement in scores across all health domains and summary scores, there were no statistical differences noted between the treatment groups (95% CI did not exclude 0). There was an overall improvement in SF-36v2 scores from baseline for both treatment groups at FW12, the effect sizes of between-group mean change in scores were small (all <0.20) (Figure 2). Treatment with EBR/GZR had no significant impact on FACIT-Fatigue Scale scores throughout the treatment period (95% CI did not exclude 0) (Figure 3). In contrast, treatment with SOF/PR resulted in increased fatigue during the treatment period as indicated by the mean reduction of FACIT-Fatigue Scale scores from baseline (Figure 3). Significant between-group differences were detected in the mean change of FACIT-Fatigue Scale scores from baseline, at treatment week 4, and at treatment week 12 (7.41 in TW4 and 7.56 in TW12; 95% CI excludes 0) (Figure 4). Further, the estimated effect sizes for these differences were moderate (both >0.50). Figure 3 Mean change in FACIT-Fatigue Scale scores from baseline. Note: Error bars indicate 95% CI. Abbreviations: EBR/GZR, elbasvir/grazoprevir; FACIT-Fatigue, Functional Assessment of Chronic Illness Therapy-Fatigue; SOF/PR, sofosbuvir with pegylated interferon and ribavirin. Figure 4 Summary of between-group differences and effect sizes for change in FACIT-Fatigue scale scores from baseline. Abbreviations: BP, bodily pain; EBR/GZR, elbasvir/grazoprevir; FACIT-Fatigue Scale, Functional Assessment of Chronic Illness Therapy-Fatigue Scale. Upon completion of treatment and at FW12, there was no observed impact of EBR/GZR treatment on the FACIT-Fatigue Scale scores. The increase in FACIT-Fatigue Scale scores observed during the treatment period for the SOF/PR group resolved, and a slight improvement in FACIT-Fatigue Scale scores from baseline was detected at FW12 (mean change =1.89, 95% CI excludes 0). No between-group difference in mean change of FACIT-Fatigue Scale scores from baseline was observed, and the estimated effect size was negligible (Figure 4). This study examined the impact of EBR/GZR vs SOF/PR on changes in PROs both during and after treatment and assessed whether any observed differences in PROs between the two treatment groups were clinically meaningful. The findings from this study demonstrate that treatment with EBR/GZR resulted in a more favorable PRO profile as compared to treatment with SOF/PR during the treatment period. Specifically, improvements in SF-36v2 scores during treatment as well as posttreatment follow-up period were observed among patients treated with EBR/GZR. In contrast, treatment with SOF/PR resulted in worsening SF-36v2 and FACIT-Fatigue Scale scores during the treatment period. Of note, the between-group differences of the Vitality domain score of the SF-36v2 exceeded the previously established MCID of 4.2 throughout the treatment period. By the end of the treatment at TW12, the between-group differences in mean change scores from baseline for the FACIT-Fatigue Scale, the SF-36v2 summary scales, and most domains of the SF-36v2 had effect sizes that were at least moderate. 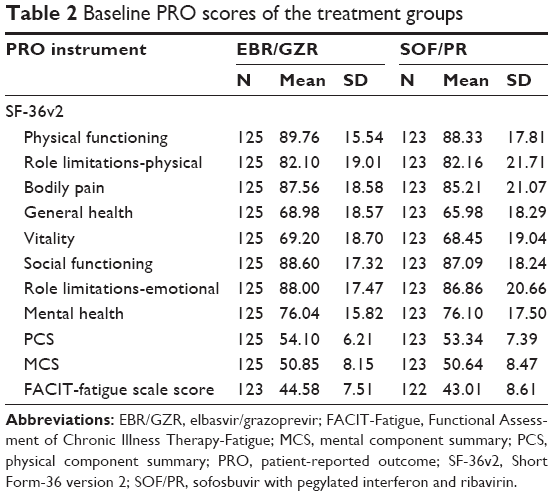 Although we did not detect any clinically meaningful differences between treatment groups by the 12-week posttreatment follow-up period, in the EBR/GZR treatment group there still were significantly improved SF-36v2 scores from baseline in the domains of Physical Functioning, Role Limitations-Physical, General Health, Vitality, Mental Health, and both the PCS and MCS scales. Improvements in SF-36v2 scores started at week 4 of treatment and persisted till posttreatment FW12. These improvements observed at FW12 were also much larger in magnitude as compared to improvements achieved during week 4 and 12 of treatment, which may suggest that the observed PRO improvement in EBR/GZR is likely to persist posttreatment. Our study results add to the evidence base that patients treated with newer generation DAA regimens without the use of PR result in more favorable PROs during the treatment period, which is likely due to better tolerability when compared to other treatment regimens containing PR. This finding has important implications as nonadherence due to treatment-related side effects or impaired HRQoL can contribute to early treatment discontinuation and, in turn, reduced effectiveness.13,32 Bernstein et al observed that among patients with HCV, fatigue scores and the physical and mental summary scale scores of the SF-36v2 were significantly associated with early discontinuation of HCV treatment.32 Similarly, another study observed that for patients receiving PR-containing regimens, lower physical-related PRO scores, particularly fatigue, were a major driver of treatment nonadherence.13 Taken together, these highlight the importance of minimizing PRO impairment during the treatment period as treatment adherence is associated with higher SVR rates.13,15 In regions such as Eastern Europe and Central Asia where PR is still a standard of practice and access to DAAs varies across countries,33,34 this likely has clinical implications. Based on our study results, patients treated with the 12-week pegylated interferon-containing regimen (ie, SOF/PR), which was the shortest interferon-based regimen available at the time of the study, reported significantly lower PRO scores throughout the treatment period compared to their baseline. This suggests that even a short course of interferon-containing therapy may not be well tolerated. Therefore, to avoid issues of treatment nonadherence or discontinuation associated with impaired on-treatment PROs, it is important to raise awareness and improve treatment access to PR-free DAA regimens in this region. This study demonstrated that HCV treatment with EBR/GZR resulted in a significantly better PRO profile during the treatment period as compared to SOF/PR. Although the improvements in PROs eventually returned to pretreatment levels at the end of therapy, the deterioration of PROs experienced during the treatment periods may negatively influence adherence and ultimately contribute to an unfavorable clinical outcome. Therefore, when deciding on the optimal therapy for HCV treatment, it is important to consider the impact that treatment is likely to have on PROs. HCV, hepatitis C virus; HRQoL, health-related quality of life; EBR/GZR, elbasvir/grazoprevir; SOF/PR, sofosbuvir with pegylated interferon and ribavirin; PROs, patient-reported outcomes; FACIT-Fatigue, Functional Assessment of Chronic Illness Therapy-Fatigue; DAA, direct-acting antiviral; MCID, minimal clinically important difference; C-EDGE H2H, C-Edge Head-2-Head; PCS, physical component summary; MCS, mental component summary; SVR, sustained viral response; PR, pegylated interferon. Initial data analyses were undertaken by Bellinda King-Kallimanis while she was an employee at Pharmerit International, LP. Funding for this research was provided by Merck Sharp & Dohme Corp., a subsidiary of Merck & Co., Inc., Kenilworth, NJ, USA. XN, SC, JML, and KEL are employees of Pharmerit International, LP. XN, SC, JML, and KEL are paid consultants to Merck for the purpose of this submitted work. CN, JMA, SP, and HLP are employees/shareholders of Merck Sharp & Dohme Corp., a subsidiary of Merck & Co., Inc., Kenilworth, NJ, USA. JQ was involved in this manuscript while she was an employee of Merck & Co., Inc., Kenilworth, NJ, USA. JS received research grants and personal fees from AbbVie, Merck, Gilead, Bristol-Myers Squibb, and Herbacos Recordati, outside of this submitted work. The authors report no other conflicts of interest in this work. Hajarizadeh B, Grebely J, Dore GJ. Epidemiology and natural history of HCV infection. Nat Rev Gastroenterol Hepatol. 2013;10(9):553–562. Maasoumy B, Wedemeyer H. Natural history of acute and chronic hepatitis C. Best Pract Res Clin Gastroenterol. 2012;26(4):401–412. Hepatitis C Fact Sheet [homepage on the internet]. World Health Organization. Available from: http://www.who.int/mediacentre/factsheets/fs164/en/. Accessed June 1, 2017. Mcdonald SA, Hutchinson SJ, Palmateer NE, et al. Decrease in health-related quality of life associated with awareness of hepatitis C virus infection among people who inject drugs in Scotland. J Hepatol. 2013;58(3):460–466. Hsu PC, Federico CA, Krajden M, et al. Health utilities and psychometric quality of life in patients with early- and late-stage hepatitis C virus infection. J Gastroenterol Hepatol. 2012;27(1):149–157. Younossi Z, Henry L. Systematic review: patient-reported outcomes in chronic hepatitis C – the impact of liver disease and new treatment regimens. Aliment Pharmacol Ther. 2015;41(6):497–520. McHutchison JG, Ware JE, et al; Hepatitis Interventional Therapy Group. The effects of interferon alpha-2b in combination with ribavirin on health related quality of life and work productivity. J Hepatol. 2001;34(1):140–147. Hassanein T, Cooksley G, Sulkowski M, et al. The impact of peginterferon alfa-2a plus ribavirin combination therapy on health-related quality of life in chronic hepatitis C. J Hepatol. 2004;40(4):675–681. Younossi ZM, Stepanova M, Zeuzem S, et al. Patient-reported outcomes assessment in chronic hepatitis C treated with sofosbuvir and ribavirin: the VALENCE study. J Hepatol. 2014;61(2):228–234. Younossi ZM, Stepanova M, Henry L, et al. Minimal impact of sofosbuvir and ribavirin on health related quality of life in chronic hepatitis C (CH-C). J Hepatol. 2014;60(4):741–747. Marcellin F, Roux P, Protopopescu C, Duracinsky M, Spire B, Carrieri MP. Patient-reported outcomes with direct-acting antivirals for the treatment of chronic hepatitis C: current knowledge and outstanding issues. Expert Rev Gastroenterol Hepatol. 2017;11(3):1–10. Evon DM. Incorporating patient-reported outcomes into hepatitis C virus treatment studies. Clin Gastroenterol Hepatol. 2014;12(8):1360–1362. Younossi ZM, Stepanova M, Henry L, Nader F, Younossi Y, Hunt S. Adherence to treatment of chronic hepatitis C: from interferon containing regimens to interferon and ribavirin free regimens. Medicine. 2016;95(28):e4151. Patel K, Mchutchison JG. Initial treatment for chronic hepatitis C: current therapies and their optimal dosing and duration. Cleve Clin J Med. 2004;71(Suppl 3):S8–S12. Shehab TM, Fontana RJ, Oberhelman K, Marrero JA, Su GL, Lok AS. Effectiveness of interferon alpha-2b and ribavirin combination therapy in the treatment of naive chronic hepatitis C patients in clinical practice. Clin Gastroenterol Hepatol. 2004;2(5):425–431. Mravčík V, Strada L, Stolfa J, et al. Factors associated with uptake, adherence, and efficacy of hepatitis C treatment in people who inject drugs: a literature review. Patient Prefer Adherence. 2013;7:1067–1075. Copay AG, Subach BR, Glassman SD, Polly DW, Schuler TC. Understanding the minimum clinically important difference: a review of concepts and methods. Spine J. 2007;7(5):541–546. Jaeschke R, Singer J, Guyatt GH. Measurement of health status. Ascertaining the minimal clinically important difference. Control Clin Trials. 1989;10(4):407–415. Sperl J, Horvath G, Halota W, et al. Efficacy and safety of elbasvir/grazoprevir and sofosbuvir/pegylated interferon/ribavirin: A phase III randomized controlled trial. J Hepatol. 2016;65(6):1112–1119. Ware JE. SF-36 health survey update. Spine. 2000;25(24):3130–3139. Mchorney CA, Ware JE, Lu JF, Sherbourne CD. The MOS 36-item Short-Form Health Survey (SF-36): III. Tests of data quality, scaling assumptions, and reliability across diverse patient groups. Med Care. 1994;32(1):40–66. Spiegel BM, Younossi ZM, Hays RD, Revicki D, Robbins S, Kanwal F. Impact of hepatitis C on health related quality of life: a systematic review and quantitative assessment. Hepatology. 2005;41(4):790–800. Foster GR. 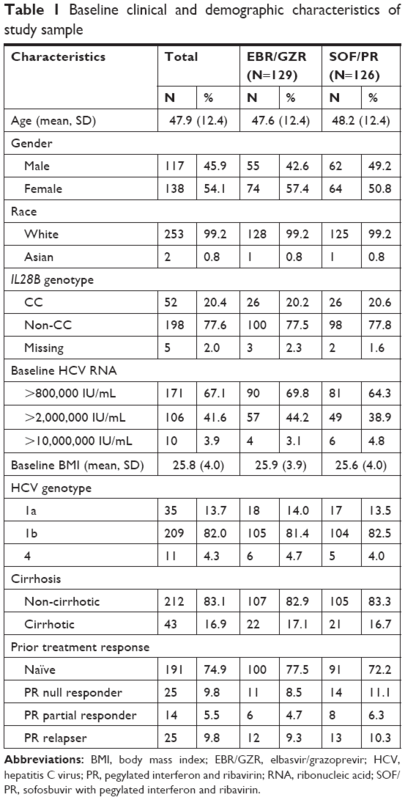 Quality of life considerations for patients with chronic hepatitis C. J Viral Hepat. 2009;16(9):605–611. Younossi ZM, Stepanova M, Henry L, Nader F, Hunt S. An in-depth analysis of patient-reported outcomes in patients with chronic hepatitis c treated with different anti-viral regimens. Am J Gastroenterol. 2016;111(6):808–816. Younossi ZM, Stepanova M, Sulkowski M, et al. Ribavirin-Free Regimen With Sofosbuvir and Velpatasvir Is Associated With High Efficacy and Improvement of Patient-Reported Outcomes in Patients With Genotypes 2 and 3 Chronic Hepatitis C: Results From Astral-2 and -3 Clinical Trials. Clin Infect Dis. 2016;63(8):1042–1048. Younossi ZM, Stepanova M, Esteban R, et al. Superiority of Interferon-Free Regimens for Chronic Hepatitis C: The Effect on Health-Related Quality of Life and Work Productivity. Medicine. 2017;96(7):e5914. Younossi ZM, Stepanova M, Feld J, et al. Sofosbuvir/velpatasvir improves patient-reported outcomes in HCV patients: results from ASTRAL-1 placebo-controlled trial. J Hepatol. 2016;65(1):33–39. Younossi ZM, Stepanova M, Afdhal N, et al. Improvement of health-related quality of life and work productivity in chronic hepatitis C patients with early and advanced fibrosis treated with ledipasvir and sofosbuvir. J Hepatol. 2015;63(2):337–345. Yellen SB, Cella DF, Webster K, Blendowski C, Kaplan E. Measuring fatigue and other anemia-related symptoms with the Functional Assessment of Cancer Therapy (FACT) measurement system. J Pain Symptom Manage. 1997;13(2):63–74. Younossi ZM, Stepanova M, Sulkowski M, Wyles D, Kottilil S, Hunt S. Patient-reported outcomes in patients co-infected with hepatitis C virus and human immunodeficiency virus treated with sofosbuvir and velpatasvir: The ASTRAL-5 study. Liver Int. 2017;37(12):1796–1804. Cohen J. Statistical Power Analysis for the Behavioral Sciences. 2nd ed. Hillsdale, NJ: Lawrence Earlbaum Associates; 1988. Bernstein D, Kleinman L, Barker CM, Revicki DA, Green J. Relationship of health-related quality of life to treatment adherence and sustained response in chronic hepatitis C patients. Hepatology. 2002;35(3):704–708. Maistat L, Golovin S, Kravchenko N, Kahn T, Babikhina K. Hepatitis C in Eastern Europe and Central Asia. Civil Society Response to the Epidemic; 2016. Available from: http://aph.org.ua/wp-content/uploads/2016/07/EECA_HCV_2016_EN.pdf. Accessed September 21, 2017. Maistat L, Kravchenko N, Reddy A. Hepatitis C in Eastern Europe and Central Asia: a survey of epidemiology, treatment access and civil society activity in eleven countries. Hepatol Med Policy. 2016;2(1):9.